Lenovo, which has long predicted the launch of the slide phone, has finally unveiled its Lenovo Z5 Pro smartphone after Xiaomi and Honor. 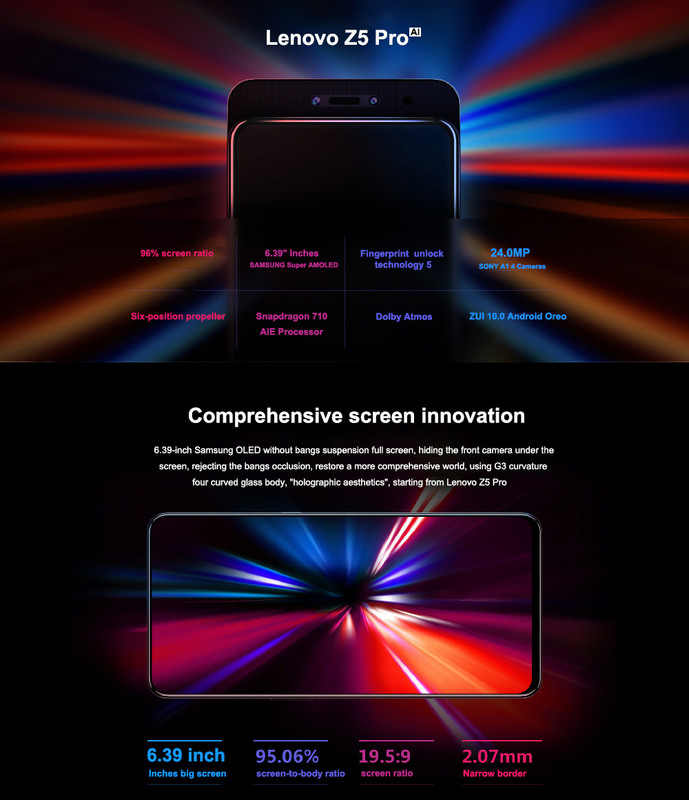 The sliding front-facing camera module and massive 95.06% screen-to-body ratio are the core selling points of the device. ● Comprehensive screen innovation of 6.39-inch Samsung AMOLED has no bangs suspension full screen, hides the front camera under the screen. ● Fingerprint of the fifth generation photoelectric screen greatly improves the accuracy of fingerprint recognition. ● Uses a sliding structure to hide the front camera, just need to slide gently to meet your unlocking and self-timer needs. ● Traditional structure carries out the six-position gold fixation, the slide rails and the mobile phone screen are accurately positioned to ensure the stability of the sliding. ● 24 million (4 in 1) and 16 million pixels SONY AI rear dual-camera camera for a clearer, more delicate image quality services, smart photos. ● A 1.8μm (4 in 1) large pixel high-sensitivity imaging sensor effectively enhances the camera's imaging ability in dark light conditions, whether it is photos or videos. ● The front-facing 16-megapixel beauty camera is based on the beauty standard, star face deep learning and oriental aesthetic features of the self-portrait. ● The 8 megapixel fast infrared in vivo camera detects 4 times the resolution of an ordinary infrared camera for a safer experience. ● A unique AI algorithm, easy to switch between natural, temperament, tough, sweet, net red and other idol styles. Also provide an additional micro-shaping solution that can adjust the facial features of the five senses. ● Lenovo Air wireless Bluetooth music headphones, using IPX5 sports waterproof design. The AI smart antenna is not easy to disconnect, and it can cope with wireless interference in a variety of scenarios. ● Dolby Atmos has a good transient response and more realistic restoration of music sound effects. ● IntelliGo AI chips solve noise problems fully and efficiently for true HD call. ● Deeply optimized Snapdragon 710 AIE processor, with 6GB of running memory, and powerful performance. ● AI game acceleration engine, CPU acceleration, GPU acceleration, memory acceleration, reduce network latency. ● Built-in independent security chip gives you a lot of security protection. ● More advanced unlocking method, infrared face recognition, no fear of all black environment. ● Provide protection from the source of payment, seven-fold secure payment. ● 3350mAh battery capacity, longer battery life, farewell to frequent charging. ● Intelligently judge the user's attention to the timeliness of the message and the frequency of using the mobile phone to achieve intelligent frequency conversion power saving. ● AI smart recognition can quickly scan and identify ID cards, documents, QR codes, etc., it can also be quickly translated. ● The ZUI 10.0 system is fully upgraded to create a smart life of deep experience.